The Floor Mosaic is an interesting subject that we could not cover in the Standard Intensive Course. That’s why we arranged this special workshop, part theory, part practical. In 5 days will be taught the techniques to develop those smooth surfaces exposed to wear, typically used for floors, walls, table tops, garden decorations, etc. 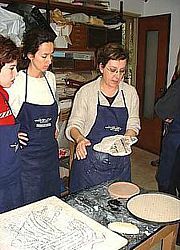 The participants will be guided through the entire process: how to choose the project, the materials, how to divide the mosaic in sections, how to develop and assemble those parts, the smoothing techniques, and much more. The portions/sections developed by each students will be framed and given at the end of the class, as a beautiful souvenir of the experience. The workshop is NOT ONLY for a large installation purpose. The same techniques can be used to any smooth surfaces subject to intensive use, regardless the dimension. Explanation of the techniques. Materials to use, modern and antique, where to find them, how to use them.How to choose the proper subject.Preparation of the work, tracing and cutting. Theory & Practice. The methods to develop large mosaic installations. Lesson on glues, binders, mortars, etc. How to divide the mosaic in sections. 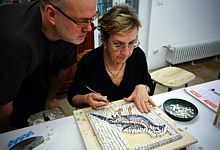 The participants will work together, in order to develop and assemble a large floor mosaic. Every student will be working an individual section (approx 40x40cm – 16×16″ inches) + one smaller piece, time permitting. Working on the individual section. The reverse technique on paper. 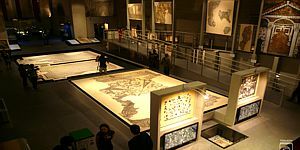 Tour city guide to the antique floor mosaics. Visit to a large installation in progress.